Railway RRB Group D Exam is also conducting today i.e. 1st November 2018. There are 62,907 vacancies for the Railway Group D posts. RRB Group D exam is taking place in three shift 1st (9 AM),2nd (12:30 PM),3rd (4 PM). This article covers the questions asked and expected cut off up to level candidate should attempt. Our AffairsGuru Team is not leaving any stone to analyse the Railway all shifts. All the aspirants who have still next shift exam, they can get clear idea about the exam pattern and difficult level. Candidates will also able to get PDF. 8 Railway Or RRB Group D Exam Analysis 1st November 2018 2nd Shift. 4. A boy sells two horse in Rs.1000, He earns 20% profit on 1st horse, and 20% loss on 2nd horse ? Find Cost Price of two horse ? 6. 1 question related to the Dhyan Chand Award ? 7. Health Day is observed on which Date ?-7 April, The theme of Health Day 2018 is ‘Universal health coverage, Everyone and everywhere’. 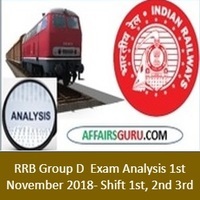 Railway Or RRB Group D Exam Analysis 1st November 2018 2nd Shift. Below are some questions asked in 2nd shift of 1st November 2018. 7. Raman is 16th from left in a line of boys, Deepak is 16th from right, No. of boys between the Raman and Deepak is 1/2 of total Find the total boys in line? Below are some questions asked in 3rd Shift of 1st November 2018. 2. What is RDX ?- Research Department explosive , It was used in World War II. 3. Express the Relation Alphabet : Word::Pearls :: ? RRB or Railway Group D Exam 1st November Shift 1 Shift 2 and Shift 3rd is over now. So, it’s time to share your experience with the exam as it will help you know bits and parts of the exam. Share your Share your RRB Railway Group D Exam Review and know where you stand among thousands of aspirants who appeared for the exam. And if you remember any questions or the type, share it with us.